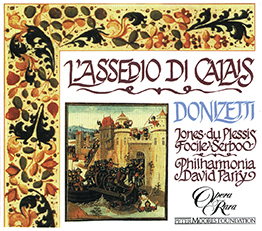 Here, for the first time the two versions of this delightful opera which Donizetti wrote for Naples. Here, for the first time the two versions of this delightful opera which Donizetti wrote for Naples. Betrayed by her fiancée and abandoned by her father, Emilia has turned her back on the world. In a most operatic coincidence, her fiancée appears on the same day as her father returns to England. 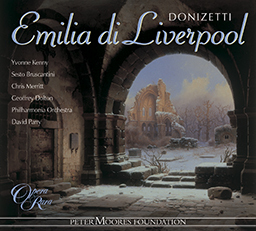 04 Emilia di Liverpool: Act I scena II: Aria: Madre! deh placati! 09 Emilia di Liverpool: Act I scena III: Zompa ? va lesto ? vi comme sta ? 13 Emilia di Liverpool: Act I scena V: S’e ver, che ? – scena VI: Spero che domattina ? – scena VII: Voi siete ? 14 Emilia di Liverpool: Act I scena VII: Duet: Che sia desso! Oh sventurata! 15 Emilia di Liverpool: Act I scena VII: Dite in grazia il vostro nome? 17 Emilia di Liverpool: Act I scena XII: Giusto Ciel! Chi vedo! Oh Dio! 20 Emilia di Liverpool: Act I scena XII: Gia s’oscura la mia mente – scena XIII: Che mi avenne! 21 Emilia di Liverpool: Act I scena XIII: Duet: Comme! Comme! Nnammorata! 24 Emilia di Liverpool: Act I scena XIV: Vive el padre? E a me non vola? 30 Emilia di Liverpool: Act II scena I: E partito? – scena II: Oh staje cca, gallone a doje facce! 32 Emilia di Liverpool: Act II scena II: Puozze mori de subeto – scena III: Deh, non mi fuggite ? – scena IV: Aggio visto ? 34 Emilia di Liverpool: Act II scena IV: Quai strida? 35 Emilia di Liverpool: Act II scena IV: Mmalora! – scena V: Ove ten vai? – scena VI: Che avvenne? 44 L’eremitaggio di Liverpool: Act I scena III: N’e? E passata veramente? 48 L’eremitaggio di Liverpool: Act I scena IV: Ah Claudio sventurato! 52 L’eremitaggio di Liverpool: Act I scena VI: Aria: Madre! deh placati! 54 L’eremitaggio di Liverpool: Act I scena VII: Duet: Che sia d’esso! Oh sventurata! 55 L’eremitaggio di Liverpool: Act I scena VII: Dite in grazia il vostro nome? 57 L’eremitaggio di Liverpool: Act I scena VIII: Ah, qual mistero in lui si asconde? 60 L’eremitaggio di Liverpool: Act I scena XII: Giusto Ciel! Chi vedo! Oh Dio! 63 L’eremitaggio di Liverpool: Act I scena XII: Venite, signore – scena I: Che avvenne? 64 L’eremitaggio di Liverpool: Act I scena XIII: Venite! Tremate! 67 L’eremitaggio di Liverpool: Act II scena V: Vive il padre? E a me non vola? 69 L’eremitaggio di Liverpool: Act II scena V: Oh come in un baleno – scena VI: Oh, haggio ? – scena VII: Fermatevi ? – scena VIII: Signor Conte! 73 L’eremitaggio di Liverpool: Act II scena IX: Per te son misero – scena X: Ah padre. Ti ferma! 75 L’eremitaggio di Liverpool: Act II scena X: Padre ? consorte ? amici ? 77 L’eremitaggio di Liverpool: Appendix: Che mai dite? The action takes place in an ‘alpine’ valley a few leagues from London, where a hermitage stands on a small hill. Ragged peasants wait patiently outside for it is now, at dawn, that Emilia appears each day to distribute alms. From Candida, the housekeeper of the hermitage, we learn that it is eighteen months since Emilia came seeking shelter in the days when her aunt, Candida’s predecessor, was alive. Emilia’s father had founded the hermitage but has since died, so Candida believes, a slave in the prisons of Africa. Emilia appears, immersed in profound grief. She can find no peace for wherever she turns she seems to be pursued by the vengeful ghost of her mother. She distributes her alms and finds her suffering briefly relieved. When they are alone, Candida asks her to finish the story of her misfortunes which she had begun earlier. She had related – Candida reminds her – how her rather, Claudio, captain of a vessel had gone overseas when she was a baby, leaving her in her mother’s care. But the agent to whom Claudio had entrusted his business affairs mismanaged them – wilfully so, we find later – and eventually news came that Claudio had been killed by barbarous Africans. Emilia herself had met a young officer, a colonel, who had sought her hand in marriage. But the match had been refused by her mother on the grounds that she was already promised to a rich Neapolitan nobleman. Unwilling to lose her, the colonel had persuaded her to elope, but that very same night she had returned home, overcome with remorse, only to find her mother dead. In despair she had come to the hermitage and thrown herself upon the mercy of her aunt. This narration is interrupted by a violent storm. Shouts for help are heard. A carriage has been overturned in the valley, and the villagers hasten to the rescue. The storm abates and the rescued occupants of the carriage appear. Don Romualdo, a Neapolitan nobleman, complains that his secretary, Federico, has saved him while leaving his fiancée, Luigia, to drown. Federico assures his master that Luigia is safe, but reveals that if he could steal her for himself he would do so. Luigia appears, declaring that they owe their lives to a passing sailor who managed to stop the bolting horses. Her deaf old father, the Count, is also helped in by the peasants, and the whole party is conducted to shelter in the hermitage. The tattered sailor now appears, heavily bearded, and in the garb of a slave. He reveals that he has returned home after twenty years’ slavery in Africa. He is, of course, Claudio. He has returned to find his wife dead and is now in search of the daughter he believes responsible. He is torn between a desire for revenge and the hope that he may yet find Emilia repentant. Inside the hermitage we learn that the travellers are on their way back to Italy, where Luigia is to wed Don Romualdo. She and Federico are determined to upset these plans, however. Luigia believes that Federico will marry her, but his intention is to deceive her, just as – he let slip – he once deceived the unsuspecting Emilia. Don Romualdo, delighted at finding himself in a convent of pretty women, tells Emilia that he came to England to meet the daughter of an English lord with whom his uncle had arranged a marriage. The similarity of circumstances is too remarkable not to strike Emilia, for she herself, before her elopement and disgrace, had been betrothed to just such a Neapolitan nobleman. As Don Romualdo reveals his name, all doubt disappears: this is the very man, and she confesses that she was the bride had had arrived to find already flown. Romualdo reveals to Federico that Emilia, his erstwhile intended, is now directress of the hermitage. A guilty Federico is filled with alarm. Claudio is admitted and refuses all reward for his services. As he comments darkly upon Federico’s resemblance to the villain who stole his honour, Emilia recognises Federico. She faints, but recovers to denounce her seducer. Luigia also rails against Federico, making her own infatuation only too plain and Romualdo realises that both his intended brides have had their hearts filched by the same villain. Claudio finds Emilia alone. He tells her at first that he is a friend of her father, but then as the sincerity of her remorse leaves him no room for further doubt, he reveals that he is Claudio himself. They fall into each other’s arms and their reconciliation is soon complete. Romualdo, while philosophising upon his unhappy lot, is interrupted by a commotion: Claudio has set upon Federico. No one can understand why an unknown sailor should turn so suddenly violent. Emilia prevents Claudio from revealing his true identity by declaring that he is a friend of her father, come to inform her of the latter’s death. All comment on the situation and hope that calm may at length return. The second act finds Luigia, now that Federico’s true character has been revealed to her, anxious to placate Don Romualdo. But Romualdo is incapable of comprehending the confusion around him. Federico begs Candida to intercede for him with Emilia. He also hopes to enlist the aid of Don Romualdo, and, when they meet, presents him with a dagger, asking him to kill him and so punish him. His argument that he was not wholly to blame, since Luigia had egged him on, only increases Romualdo’s ire. Emilia arrives on the scene and together with Romualdo vents her indignation on the hapless, though repentant Federico. Claudio summons Federico to follow him to the underground tomb of Emilia’s mother where he plans his ultimate vengeance. Candida overhears his plan and warns Emilia. Enlisting the assistance of Romualdo, they hasten to the vaults in pursuit. In the sepulchre of the Liverpool family a portrait of Emilia’s mother rests against a newly erected tomb. Federico, recognising it, is more demoralised than ever. Claudio at last reveals his true identity and offers Federico a choice of pistols, at the same time demanding that he sign a confession of guilt. Federico is willing to do whatever is required of him but refuses to take arms against the father of Emilia. As Claudio is about to shoot him, Emilia, Candida, Romauldo, Luigia, the Count and the villagers come crowding down the stairs. Claudio’s identity is made known to all. Federico reveals that Claudio’s innocence has been established and now that the dishonest agent who mismanaged his affairs has been duly punished, he has been officially reinstated in all his possessions. Claudio’s generous reaction is to forgive Federico, and Emilia, convinced that her erstwhile seducer is now truly repentant, gives him her hand. 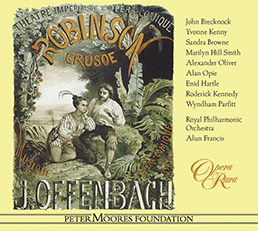 Luigia takes advantage of the universal impulse towards forgiveness to elicit her own pardon from Don Romualdo, and the opera ends as all look forward to a propitious double wedding. The action takes place in and around the hermitage of Liwerpool, situated on top of a mountain and a short distance from London. A violent storm breaks out and Giacomo, the steward of the hermitage, urges the local mountain dwellers to hasten down to the valley below, where a carriage has been overturned. As the storm subsides, the rescued travellers appear. The first is Asdrubale, a Neapolitan count. He is concerned for his niece, Bettina, and their travelling companion, Tomson. But they too appear, safe, with Tomson reassuring – indeed, flirting with – Bettina. Asdrubale rewards the mountaineers for their services, but regrets that a passing sailor, who played a major part in their rescue, is nowhere to be seen. The party is conducted to shelter inside the hermitage. The sailor appears, heavily bearded, and in the garb of a slave. He reveals that he has returned home after twenty years’ slavery in Africa. He is, in fact, Emilia’s father, Claudio. He has arrived back to find his wife dead, and is now in search of the daughter he believes responsible. He wonders whether she may have taken refuge in this hermitage, founded by his ancestors. He is torn between a desire for revenge and the hope that he may yet find Emilia repentant. Giacomo, finding him on the doorstep, tells him that those he helped rescue are anxious to reward him, but he refuses all suggestion of recompense. Learning that it is indeed Emilia who dwells in this lonely spot, he reveals his familiarity with her father’s circumstances. A black calumny, he relates, made Claudio appear a traitor while in fact he exposed his life for his king, with the result that he was exiled and his goods confiscated. He fell into slavery and languished in the prisons of Africa. Giacomo invites him into the hermitage, but Claudio is uncertain whether he can bear to see his daughter who has allowed herself to be seduced by a villain named Villars. Her disgrace has brought her mother to her grave, and she has forfeited all chance of marriage with the rich Neapolitan to whom she was once betrothed. But his anxiety to know whether she is genuinely repentant finally gets the better of him. In the hermitage courtyard, Emilia distributes alms to the poor of the village. She tells Candida that she is unable to find lasting peace, for wherever she turns she seems to be pursued by the vengeful ghost of her mother. Asdrubale enters to pay his respects. Emilia learns that he is a Neapolitan, come to England accompanied by his niece, to fetch the bride he has contracted himself to marry. He had arrived, however, to find that his intended had eloped with another. The similarity of circumstances is too remarkable not to strike Emilia. As Count Asdrubale reveals his identity, Emilia confesses that she as the errant bride. She retires in distress. Claudio is escorted in by Tomson and presented to Asdrubale. Tomson grows alarmed, for it is now that he discovers that the directress of the hermitage is Emilia, and we learn that he is none other than Colonel Villars, her seducer. Claudio now sees vengeance within his grasp. Pointedly he tells Tomson of his resemblance to a villain who stole his honour and brought destruction upon his family. Increasingly impassioned, he nevertheless manages to restrain himself before actually revealing his identity. Tomson is left, a prey to fears and presentiments, but still ignorant of the identity of this man who eyes him so threateningly. Tomson begins to regret his past conduct. He would gladly disillusion Bettina and make his peace with Emilia. But before he can do so, Asdrubale returns and demands satisfaction from him for having stolen Emilia. Bettina mistakenly thinks they are speaking of her, and she throws herself at her uncle’s feet, protesting that Tomson is honourable and has promised to marry her. Asdrubale is doubly irate: not only has Tomson stolen Emilia, but now he is trying to make off with Bettina as well. At this moment Emilia enters to invite them to share a frugal meal. She and Tomson immediately recognise each other. Emilia faints, but recovers to denounce her seducer. Tomson is assailed by Claudio and Asdrubale. As the situation grows potentially more and more violent, Emilia, Candida and Bettina summon Giacomo and the mountaineers to keep the peace. In the second act, the mountaineers, led by Bettina and Candida, wonder why an unknown sailor should have stirred up such a hornets’ nest of trouble. Bettina is curious to know who this sailor really is, but all that Giacomo can tell her is that he claims to be the companion in misfortune of Emilia’s father. Giacomo is more concerned that a wild-eyed Tomson is searching for Asdrubale. A moment later, therefore, when they come across the Count, they warn him that they fear he is in great danger. Claudio finds Emilia alone. He tells her at first that he is a friend of her father, but then, moved by the sincerity of her remorse, reveals that he is Claudio himself. They fall into each other’s arms and their reconciliation is complete.